The death of one’s child to cancer – or due to any reason, for that matter — is one of the most emotionally devastating events that could befall a person. While suffering intense sadness, each parent handles the grieving process in unique ways. But Christine Denhup, an assistant professor of nursing at Southern Connecticut State University, recently found five common threads among parents who participated in an in-depth study of what their lives have been like since losing their child. The qualitative study involved lengthy interviews with six parents across the country – five mothers and one father – from six different families who had lost a child to cancer. Their children’s ages ranged from 4 to 12 at the time of death, and their illnesses included leukemia, lymphoma and brain tumors. The interviews were conducted at least 16 months after the loss of their child, but in one case, 41 years had elapsed. *New State of Being – Participants said they were thrust into a permanent “new normal” after the loss of their child. “They referred to it as the aftermath of a tsunami in their lives,” Denhup said. After the initial grief, many changes persisted. *Profound Suffering – Each individual had “triggers,” things that sparked an acute bout of increased negative emotions. Those specific triggers differed from person to person, but each experienced them in some way. “For one parent, seeing their child’s friends growing up was a trigger,” Denhup said. “Yet, for another parent, seeing their kid’s friends grow up helped reduce their suffering.” All experienced profound suffering at certain times, triggered by different stimuli. *Self-renaissance – Their identity – who are they are a person – changes forever. They developed a “pretend self” to help them cope with day-to-day life. For example, they might be very sensitive to their loss at home, but at work, they take on a different persona that helps them avoid an emotional meltdown. *Journey Toward Healing – In learning to live with the loss, the parents developed forms of self-care. For one parent, journaling about their feelings and experiences was a way to help them. Denhup said that family, friends and co-workers often will try to help the parents through the most difficult periods. But she said there are some approaches that can help to mitigate their suffering, while other approaches may provoke increased sadness, unintentionally. Positive steps that others can take include remembering the children in some way and engaging in a conversation about the children if the parents are willing or eager to do so. But comparing their own losses to a parent’s loss of a child often elicits a negative response because of the perceived disproportionate grief. Similarly, relatively trivial complaints about their own life is bound to engender a similar reaction. Worse, telling a parent that they have other healthy children or that they need to get on with their lives can be very hurtful. Last fall, Denhup delivered a presentation, “Advancing Nursing Knowledge of Parental Bereavement Through Phenomenology,” during a joint meeting (via video-conferencing) between nursing faculty at SCSU and Liverpool John Moores University. The two universities entered into a partnership last year. 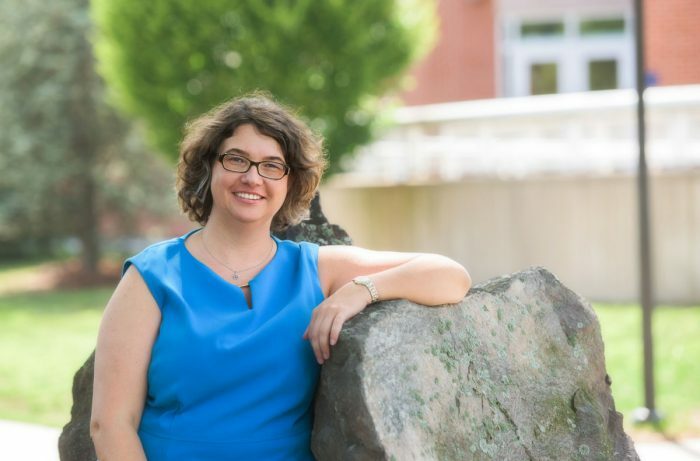 Southern’s graduate degree programs that instruct educators on the teaching of reading have earned a full three-year accreditation from the International Dyslexia Association (IDA). Southern is one of only about 26 schools in the country – and only the second in Connecticut – to have earned that designation since the organization began offering accreditations in 2012. The accreditation applies to both the Master of Science degree and Sixth-Year Certificate programs in reading. It is awarded to schools that are deemed by IDA to best be able to train teachers to alleviate, prevent or remediate reading difficulties, including dyslexia. IDA is a non-profit, scientific and educational organization dedicated to the study and treatment of dyslexia, as well as related language-based learning differences. During the accreditation process, independent reviewers are assigned to each university to evaluate their programs and determine whether they align with IDA Standards. The review examines course syllabi and other course materials and requirements, as well as interviews with program directors and a site visit to the school, according to the IDA website. “Our reading faculty have always had a sterling reputation in Connecticut and the impact that they have had on reading teachers has been profound. But this designation validates our program even further, based on the science of reading,” said Ruth Eren, chairwoman of the SCSU Special Education and Reading Department. She noted that the department has long held and continues to hold an accreditation from the International Literacy Association, which is considered the gold standard among higher education reading programs. In addition, 97 percent of students in the program have passed the state reading specialist exam to obtain certification in Connecticut since the test started in early 2015. “Our goal in pursuing this additional accreditation was to best address the instructional needs of students who may or may not be working to capacity due to dyslexia and other types of reading disability,” said Regine Randall, SCSU graduate reading program coordinator. The designation also will help students in their search for teaching jobs. Laura Raynolds, SCSU associate professor of special education and reading, pointed out that state Individualized Education Program documents now include a check off box specifically about whether a student has dyslexia. The forms must be filled out by educators regarding the program of instruction for student with disabilities. Previously, the document required teachers to check off whether a student had a learning disability, but now dyslexia is a sub-category. “School PPT (Planning and Placement Teams) teams want someone who is well-versed on dyslexia, and this accreditation will give students graduating from our program an extra boost,” Raynolds said. An estimated 3 to 20 percent of the population is considered to have some form of dyslexia. SCSU had 94 students enrolled in its graduate reading programs last fall. 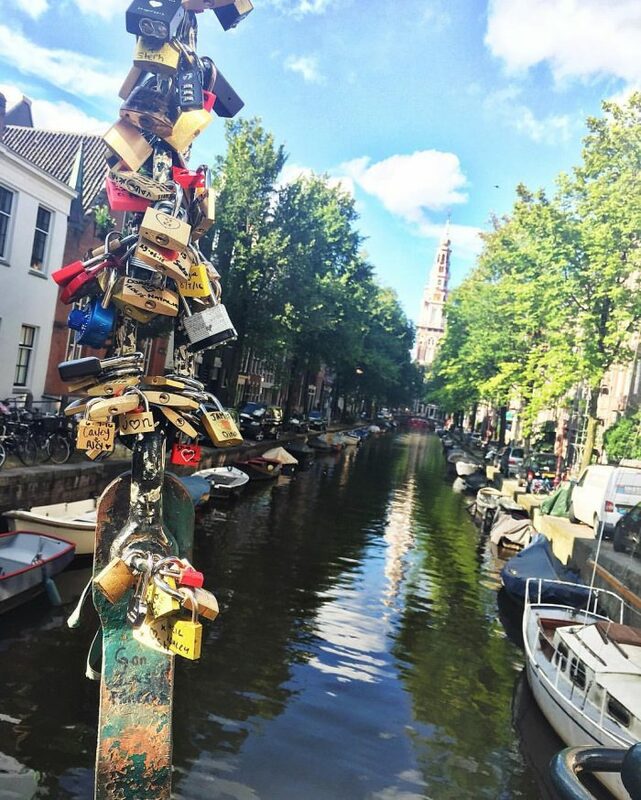 You may or may not already know, but Amsterdam is one of the most fascinating places to visit. Why? Amsterdam is rich in culture, historical monuments, and politics. Today in class we focused a lot on religion and politics in the Netherlands. Our guest speaker, David J. Bos, Ph.D., took us on a journey through the history of Amsterdam. Some interesting aspects I learned were the differences between religions, and how religion plays a major part in today’s votes for office, such as parliament. Pillarization (a separation of society) still takes place even today. In comparison, one might look at the requests catholic, orthodox protestant, socialists, and liberal protestants made when demanding that their religion deserve the most privileges – good education, health care, and media were the aspects each religion had most in common. Throughout the ages, segregation and religious battles continued. Today anyone can vote for parliament, providences, and the European parliament. Amsterdam has come a long way from hundreds of years ago. After class we winded down and ate a short lunch in the University of Amsterdam’s cafeteria. Later, we visited the Museum of Amsterdam. 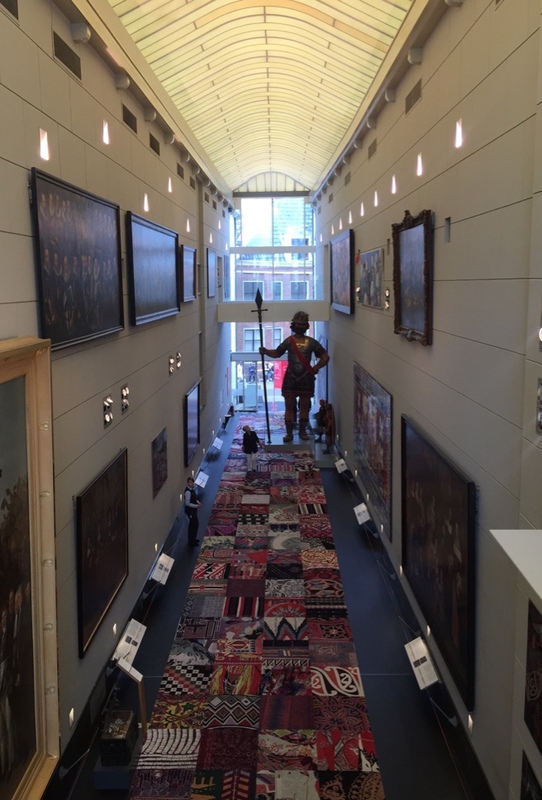 There were audio recordings, which talked about the history of Amsterdam, as well as rooms that depicted modernized culture and artwork. Spoiler alert! Inside the museum are many artifacts and knowledge about gay heritage, and the effects of Amsterdam’s drug and brothel culture. As the night ended, we came together as a group and chatted in the courtyard of our dormitory, then took a walk to get a “late night” snack near the infamous Red Light district. We’ve been here since Friday and the weekend gave us all a great opportunity to get the lay of the land and explore different parts of the city. Settling in and getting comfortable for the month-long classes, we all have been talking about what we’ve seen and how interesting the Dutch people and their culture are. The most interesting thing to me so far is how many bikes there are and the many different and creative ways I’ve seen people riding them. There have been some bikes with single riders while on other occasions, there have been one bike with three people on it: the person peddling, a small child on the back wheel, and another on the handle bars. Since getting here, we’ve explored many different restaurants and tried many new foods. Today marked our first day of actual class and we got to meet Mirjam, the program director here at the University of Amsterdam. She gave us an introduction to Dutch life, told us what to expect from the program, and gave us our welcome packets of information. She talked a little about how that the Dutch built Amsterdam on the sea and we are actually below sea level. We reconvened after lunch to discuss our overall experience so far here in the Netherlands and specifically what we are going to learn about. We got our first reading assignment and are all set to kick off tomorrow with our first guest speaker! The Board of Regents for Higher Education has voted to select Dr. Joe Bertolino as the 12th President of Southern Connecticut State University. A Board of Regents search committee recommended Dr. Bertolino among three finalists after a five-month long nationwide search. Dr. Bertolino is currently the President of Lyndon State College in Vermont and Special Assistant to the Chancellor for System Integration and Related Efforts at the Vermont State Colleges. He replaces Dr. Mary Papazian who resigned as of July 1. He will begin August 22, 2016, at an annual salary of $294,700. From a unique outdoor classroom to one-of-a-kind works of art, here’s a look at a few quintessentially Southern locations. When you spy these views, you know you’re in Owl territory. A tie to Southern’s past, Founders Gate is part of a newly instituted tradition: each fall, the incoming class enters campus through the gate following new student convocation. In the spring, graduating seniors will cross it again to mark the culmination of their undergraduate experience. 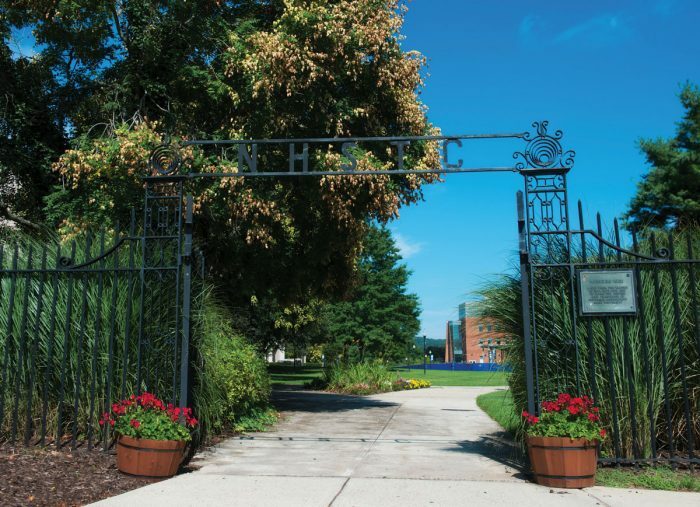 The gate spans the area between Lyman Center and Engleman Hall, but originally stood on the school’s first campus on New Haven’s Howe Street. After being restored and moved to its current location, it was dedicated during Homecoming in 1987. 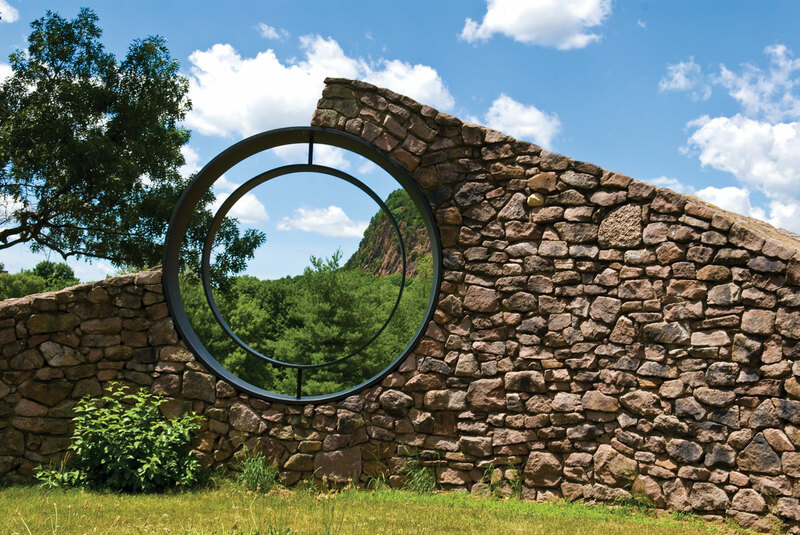 A unique outdoor classroom, the Geological Rock Garden includes 52 rocks that are indigenous to Connecticut. Numerous quarry operators in the area donated boulders for the display, which was created with the aid of Thomas Fleming, chairman of the Department of Earth Science. Some of the boulders are from Stony Creek Quarry, which provided stone for many iconic buildings and monuments, including the base of the Statue of Liberty, Grand Central Station, and the Smithsonian Institution. 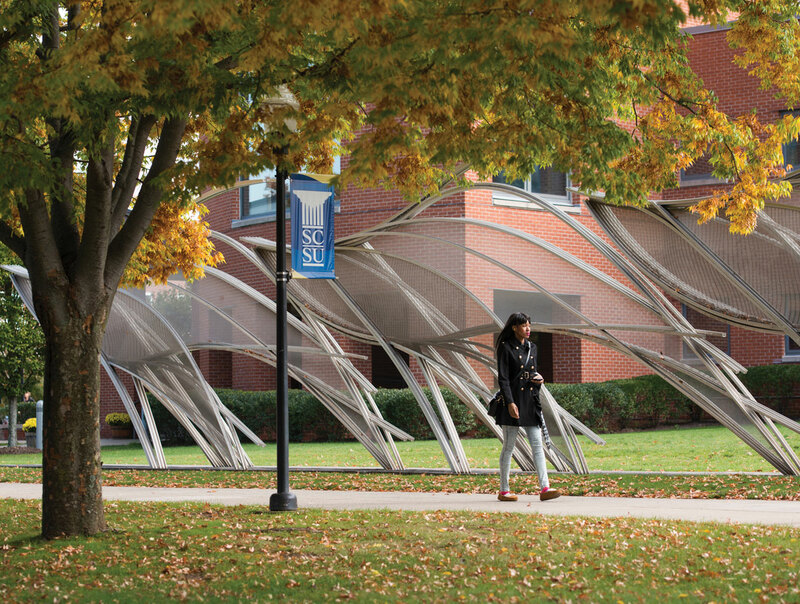 Set along a well-traveled path on the Fitch Street side of Engleman Hall, the stainless-steel sculpture, “H20: Liquid Zone,” was designed by award-winning international landscape architect Mikyoung Kim. Rain, snow, and ice collect on the sculpture, changing the view on an ongoing basis. The artist’s stunning portfolio includes the Crown Sky Garden in Chicago, the roof garden of the John Hancock Tower in Boston, and the ChonGae Canal Restoration Project — Source Point Park in Seoul, Korea. Is it an Owl’s outstretched wings, an open book evoking the quest for knowledge, or perhaps both? 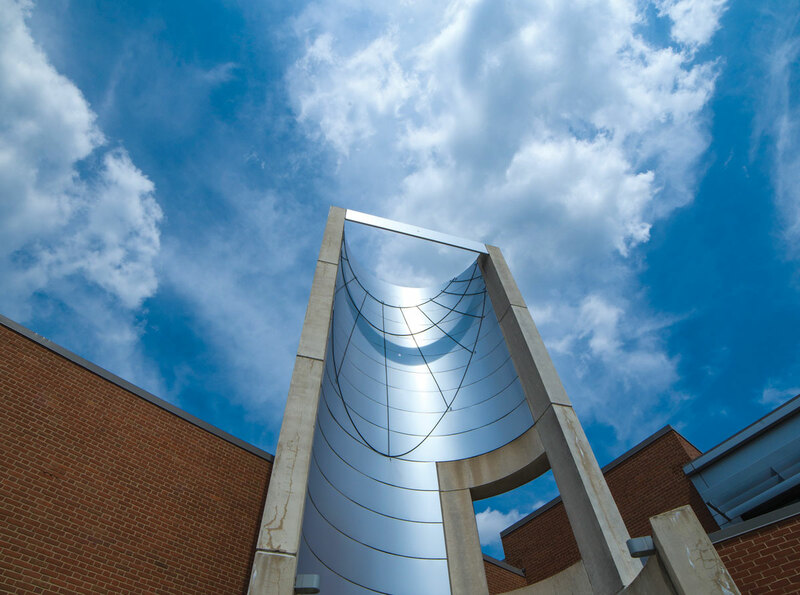 Perched on top of Engleman Hall, this sculpture can be seen from much of Southern’s campus. Every cloud has a silver lining, and, on campus, it’s the rain harvester located outside of the Academic Science and Laboratory Building. 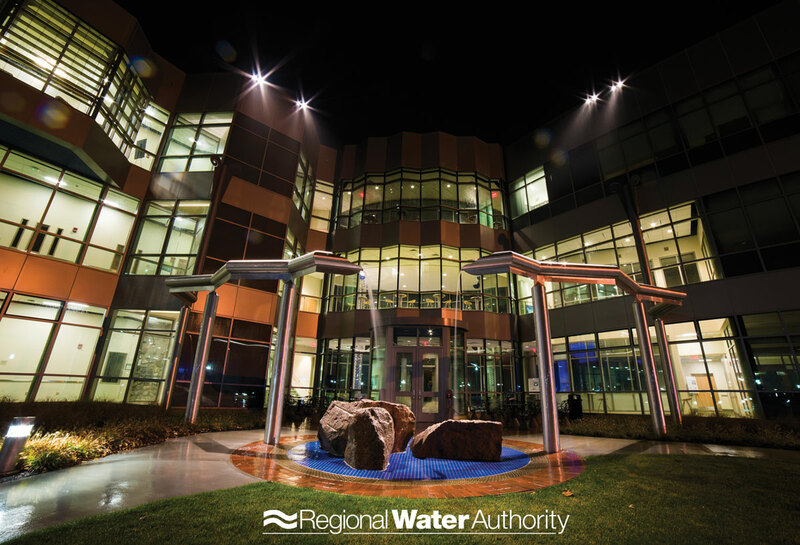 Named in recognition of the South Central Connecticut Regional Water Authority for its leadership-level support, the rain harvester is ecologically sound as well as beautiful. Water drains into a 40,000-gallon underground collection system that is used to water surrounding greenery — reducing the need for irrigation of the area by 50 percent. An ultraviolet-purification system eliminates bacteria. Incoming students are invited to learn many things during orientation, including how to tell time using the nearly 50-foot-tower sundial found on Engleman Hall. Built in 2005 of precast concrete and aluminum, the sundial is an award winner. 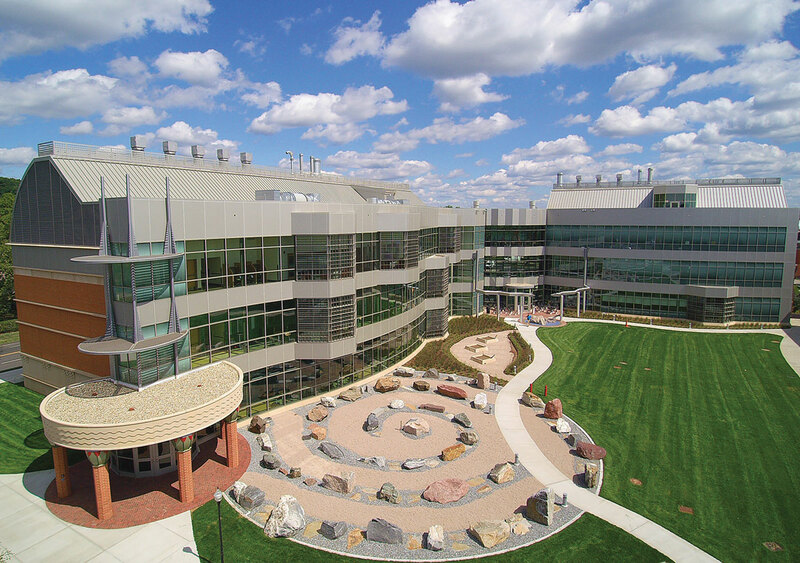 The American Institute of Architects’ Connecticut chapter recognized it as the top design in the art/architecture category in 2006. The project’s architects are Howard Hebel (Herbert Newman & Partners) and Frederick Sawyer, who is a co-founder of the North American Sundial Society. Those who haven’t mastered Southern’s sundial turn to the Hilton C. Buley Library clock. The bars light up in blue to show the hour, while the dots glow a golden hue for minutes. 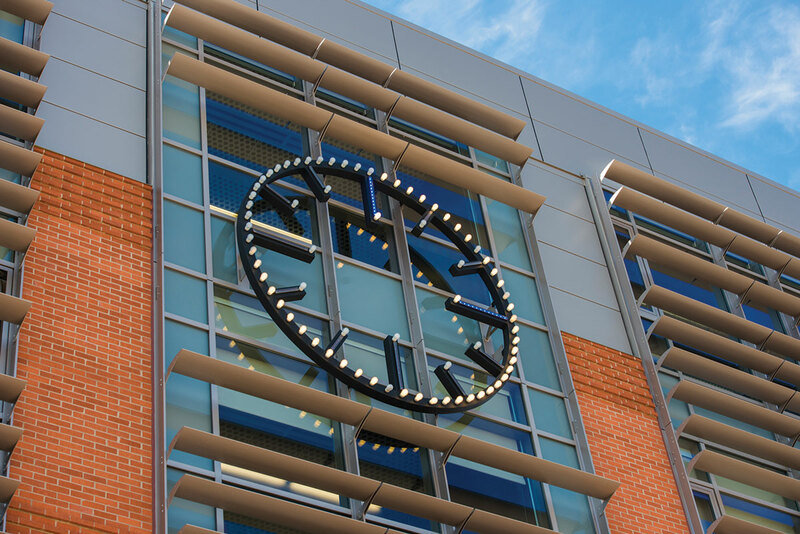 The clock was installed in 2015 as part of the renovation of the original section of the library. For a picturesque view of campus, go to the fourth floor of the library and look out of the clock’s transparent face. 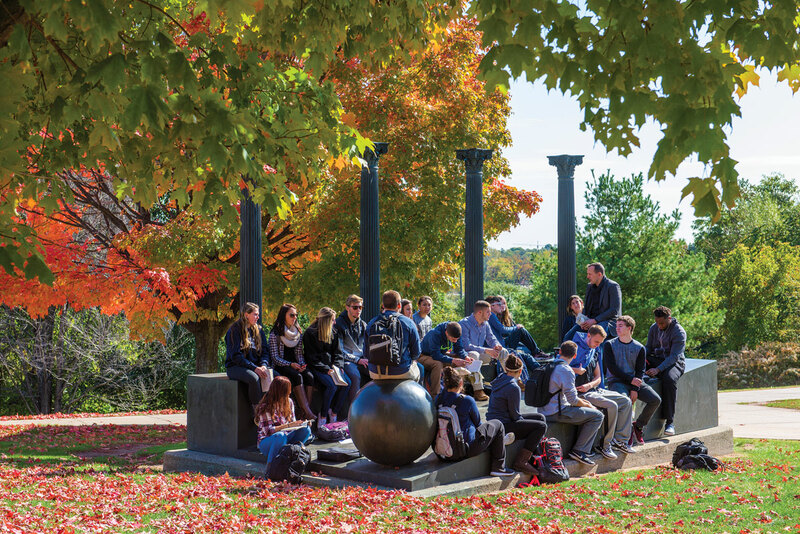 Set on a hill overlooking the campus pond, the bronze sculpture, “Serie Metafisica XVIII,” was created by Herk Van Tongeren and installed on campus in 1983. In 1987 the New York Times fittingly described the late sculptor’s work: “The walls, columns, and steps of the theaters were mysterious and incomplete. 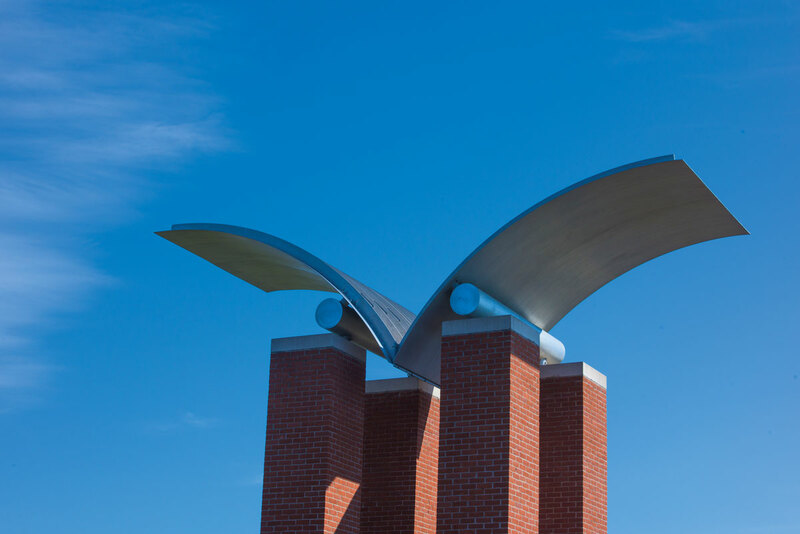 They suggested Greek and Roman theaters, but it was unclear who would take their place on stage and what roles they would assume.” On sunny days, students are often found sitting on the sculpture, bringing Tongeren’s vision to life. Decades later, comics remain Hallock’s passion as well as his livelihood. 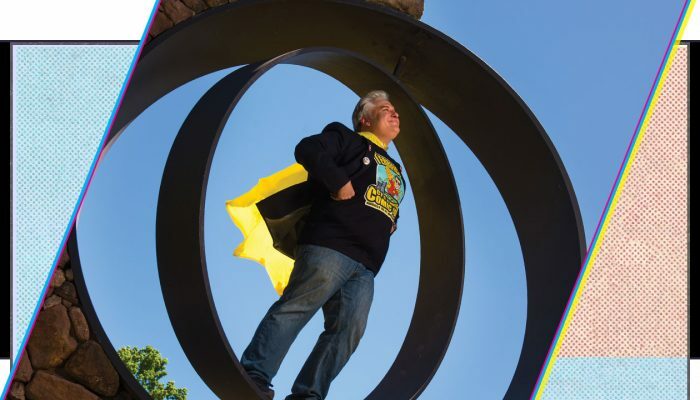 After working as an art director and in marketing, the self-described “fanboy” went on to launch TerrifiCon™, an annual Connecticut-based comic con — or comic convention — that showcases comic books and their creators, as well as films, television programs, pop-culture, and gaming. This year, some 25,000 fans are expected to attend TerrifiCon™, held Aug. 19-21 at the Mohegan Sun Convention Center in Uncasville, Conn. The event sold out in 2015, and based on industry trends, the future is promising. In 2014, comic book sales in North America (print and digital) were about $935 million, according to Comichron and ICV2, which tabulate industry statistics. The popularity of comic book-related films and television shows is at an all-time high as well. “Marvel’s The Avengers,” the top comic book-film adaptation to date, had worldwide ticket sales of more than $1.4 billion, according to Box Office Mojo (BOM). Equally telling, at press time, BOM listed more than 35 comic book film adaptations in development. “In the early 2000s, the film industry realized that special effects had reached a point where we could capture what we could draw. We could show all of these great stories on film,” says Hallock. His own story is intrinsically tied to Southern. Hallock majored in art, working as a staff cartoonist for the student newspaper, and as an actor and publicity director for the university’s Crescent Players. He met his future wife, Sharon, while working on a production. Hallock also connected with other classmates who would later work in the comic book industry. He took art classes with Ron Garney, now an acclaimed comic book artist and writer known for his work on JLA (Justice League of America), The Amazing Spider-Man, Silver Surfer, Hulk, Daredevil, and Captain America. And in student theatrical productions, Hallock also crossed paths with Michael Jai White. White, now an accomplished professional actor and martial artist, played the title role in “Spawn,” becoming the first African American to star as a superhero in a major motion picture. Hallock has run into both former classmates at industry events. 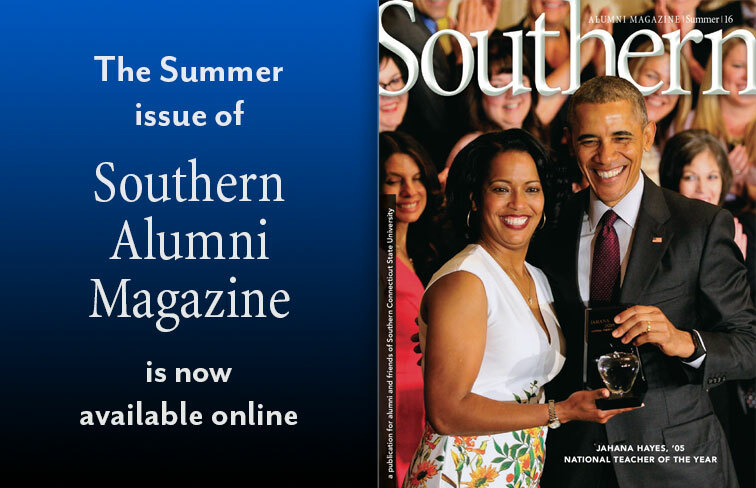 Following, he shares memories from these impromptu mini reunions and a few pivotal life moments — including being fired from Southern’s student newspaper. Hallock has loved comics for as long as he can remember. His earliest memories include drawing Fred Flintstone on the wall of his home. He was 3. Comics remained a childhood passion. Following in the footsteps of his aunt and older sister, Hallock came to Southern. He was an active member of the Crescent Players. Hallock continued to love comics. He found work in a creative field. Hallock also kept thinking about comics. So he reached out to a stranger. He later rocked his dream interview. He continues to love comics — and his alma mater. “I had class with [alumnus] Ron Garney, an amazing artist with Marvel. He used to be a bartender in New Haven many years ago. At the time, Batman 1989 was premiering and there was a costume contest. I dressed up as the joker. Many years later, we ran into each other at a comic con, and realized I’d ordered a drink from him — dressed like the joker. He’s an amazing artist. Hallock continued to love comic cons. So he founded TerrifiCon — and is living the dream. He says he’ll always be a fan — and here’s one reason why. And he’ll never tire of meeting his fellow fans at TerrifiCon™. For more, go to terrificon.com. IBM and Southern recently teamed up to offer a “boot camp” for about 70 university students and faculty members in the use of IBM Watson Analytics – a cutting-edge, cloud-based service designed to simplify and enhance data analysis. 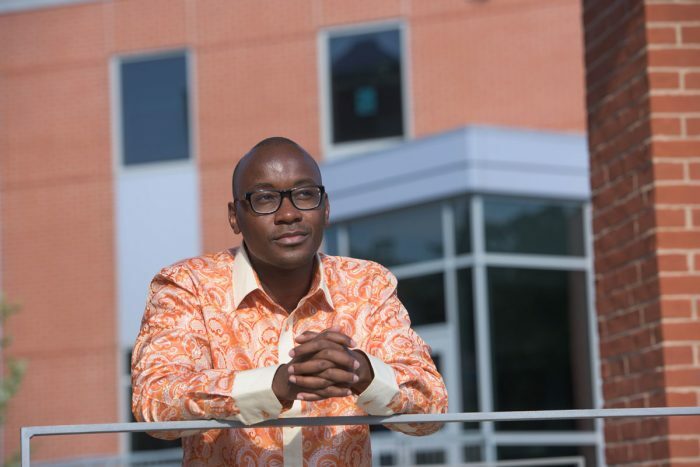 The participants engaged in a two-day program, which focused on how to analyze “big data,” as well as understanding analytic software and offering a taste of what it is like to work as a data scientist. The program was offered for free by IBM, according to Michael Ben-Avie, SCSU’s director of the Office of Assessment and Planning and coordinator of the boot camp. “We thank IBM for its willingness to offer this program at no cost to our students,” Ben-Avie said. “This was a great opportunity for Southern.” He added that students also received free five-year licenses for Watson Analytics. The program came about as a result of a budding relationship between the university and the technology giant. While the software has been used for a variety of purposes, including by faculty as a classroom tool, Ben-Avie said Southern’s use of it marked the first time a university has used it at the institutional level to discover trends and important predictors of student success. IBM began showcasing SCSU as an example of how the data can be used successfully for university-wide purposes. “I don’t think you’ll find anyone who is as passionate about student success as Michael,” said Randy Messina, an IBM representative. Those who successfully completed the two-day program earned an IBM Certificate of Achievement that will provide students with an edge when applying for jobs or graduate school, Ben-Avie said. Data analytics is a growing field used increasingly by businesses and other organizations. In 2008, Sean Grace was helping one of his graduate students with her thesis on kelp growth in Long Island Sound. Back then, finding suitable specimens to study was easy. The region’s kelp beds were abundant and thriving, like a plush and well-maintained lawn carpeting parts of the sound’s rocky coastline. “The kelp beds were so thick that in some areas you couldn’t put your hand down without putting it on multiple kelps,” recalled Grace, a marine biologist and associate professor of biology at Southern, who has been diving in the sound for two decades. Today, he doubts he could find enough to adequately conduct the research. “You barely see any kelp out there,” he said. Kelp is a type of brown algae found in underwater forests. Grace, who co-directs Southern’s Werth Center for Coastal and Marine Studies, is working to document that dramatic decline, which scientists and divers have been reporting anecdotally over the last several years. He is one of a worldwide network of marine scientists who make up the Kelp Ecosystem Ecology Network, or KEEN, an organization attempting to examine the effects of global climate change on kelp habitats. Scientists aren’t sure what’s decimating the kelp population in the Sound, but Grace said it is likely rising water temperatures are making the environment too warm for kelp, which prefers colder waters. Long Island Sound is the southernmost point on the East Coast where kelp beds grow naturally, Grace explained. While kelp beds in waters north of Cape Cod remain healthy and plentiful, once-covered spots in the sound and in Rhode Island’s Narragansett Bay are now bare, except for “a few algae here and there,” Grace said. Around the world, other coastal spots on the fringes of where kelp beds usually thrive are seeing similar drops, he said. The decline of the seaweed forests is a huge loss, said Grace, not only for divers who admire their beauty, but for the rich collection of marine life that gets its food and shelter from the kelp beds. Kelp serves as a natural habitat for everything from fish, crabs and urchins to a multitude of invertebrates. It also keeps the Sound healthy by producing oxygen and collecting pollutants from the water, said Grace, who holds both a master’s and a doctoral degree in biological sciences from the University of Rhode Island. While some fisherman have been successful growing kelp in Long Island Sound for use in the food industry, the farmed variety does not offer all of the same environmental benefits, he noted. “They’re having great success and that’s good to hear, but these are literally ropes that are seeded with baby kelp and hanging in the water. It’s not a natural kind of setting,” Grace said. Grace said his research will look at kelp beds throughout the Sound with known kelp habitats, including Branford’s Thimble Islands and spots off the north coast of Long Island. In addition to comparing existing kelp populations to those documented in previous studies, Grace said he will collect data on water temperature, acidity, dissolved oxygen levels and other conditions to try to pinpoint the cause of the decline. “We’re looking at a whole lot of causes that might be affecting this, anything from temperature changes to an invasive species coming in and out, although we haven’t seen much evidence for that,” Grace said. Jarrett Byrnes, assistant professor of biology at UMass Boston, and Aaren Freeman, associate professor of biology at Adelphi University in Long Island, are collaborating on the project. Grace said Southern’s inclusion in the global endeavor is “a major step forward for the sciences” at the university. With 25 percent of the world’s coastlines covered with kelp forests, the research is expected to have far-reaching implications.